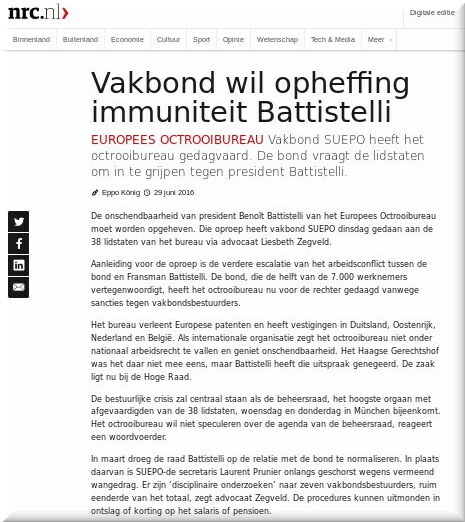 THERE IS a new NRC article about Battistelli’s EPO today. It helps reveal just how far the EPO’s “lines of defense” would go to protect the ‘King’, who has been busy defaming a truth-telling judge and breaking many of his own rules in the process. “At the European Patent Office,” says yesterday’s article from French media, “the French boss ferments anti-Union culture” (that’s what the headline says, albeit a proper translation is needed). The article should say he’s against the rule of law, not just unions. The man has gone totally off the rails and he now wastes a fortune on personal bodyguards. Instead he should resign, sparing these costs and giving the EPO a chance at long-term survival. “Unfortunately,” told us one person about the French article, it is “not fully complete (no indication of the firing of staff representatives) but at least a bit of coverage” (there’s more coming in English for sure). EUROPEAN PATENT OFFICE. SUEPO, the union representing EPO staff, subpoenaed the patent office. The union calls on Member States to take action against President Battistelli. The immunity of President Benoît Battistelli of the European Patent Office should be repealed. SUEPO requested the 38 Member States of the Agency to do so through lawyer Liesbeth Zegveld on Tuesday. The reason for the call is the further escalation of the labour dispute between the union and Frenchman Battistelli. The union, which represents half of the 7,000 workers, has now taken the patent office to court because of sanctions against trade unionists. The agency grants European patents and has offices in Germany, Austria, Netherlands and Belgium. As an international organization, the patent office does not fall under national labour law and enjoys immunity. The Hague Court contested the immunity, but Battistelli has ignored that ruling. The case is now before the Supreme Court. The administrative crisis will take center stage as the management board, meets the highest body with representatives from the 38 Member States, Wednesday and Thursday in Munich. The patent office does not want to speculate on the agenda of the management board, says a spokesman. The management board instructed Batistelli to normalize the relation with the union in March. Instead SUEPO-Secretary Laurent Prunier was recently suspended for alleged misconduct. There are “disciplinary inquiries” for seven union officials, more than a third of the total SUEPO officials, says lawyer Zegveld. The procedures could result in dismissal or reduction in salary or pension. The union has filed a lawsuit in the Hague court to let the judge investigate the disciplinary measures independently. The bailiff who came to deliver the subpoena was escorted off the property by five security guards. They even refused to tell him where the mailbox is. A number of important countries, such as Germany, France and Switzerland, are very critical of Battistelli. Their irritation was recently enlarged by Batistelli who personally exercised pressure in dismissal proceedings against an Irish patent judge. Battistelli demanded in a letter that the judge would not be granted a public hearing by a Board of Appeal. The Board of Appeal stated that its independence was at stake and did not accept the dismissal. The patent office does not respond to individual cases, said the EPO spokesman.